Canadian Natural develops every project with a vision and plan to ensure the landscape is returned to a healthy ecosystem once our activities are complete. Land use planning is an integral part of our operations. Canadian Natural develops every project with a vision and plan to proactively manage our impact on the land, and ensure we return all our worksites (wells, pipelines, mines, roads) to a healthy ecosystem once our activities are complete. By taking a proactive approach to environmental obligations, we responsibly manage our footprint. Our land management practices minimize the impact of our projects on the land, reduce our operational footprint and progressively reclaim land across our operations. We also work with stakeholders to ensure their present and future needs are met. To do this, we incorporate innovation, best practices and lessons learned into our land management programs. For example, in our Primrose and Wolf Lake (PAW) and Kirby South thermal in situ operations, we reduce the overall number of drill sites required by designing compact and efficient multi-wells pads (with multiple wells on a single pad). To reduce the total land disturbed, we also re-use existing roads and clearings of former sites, avoiding additional vegetation and topsoil removal. Canadian Natural understands that reclamation is progressive and we take the necessary steps to ensure it is done right. All reclamation is conducted to return land to equivalent surrounding landscapes, whether that is boreal forest, native prairie or agricultural land. We adapt our reclamation approaches as appropriate for different ecological locations, based on specific requirements for each type of area to manage soil and vegetation as well as landform. For example, for local and native vegetation reclamation, our work involves return of soils and vegetation that integrate with the adjacent landscape. At native prairie sites, we focus on minimizing site disturbance throughout the operating stages of the site and at the time of well abandonment. In this way, we ensure native grass species have the opportunity to reestablish on the location. In the forest zone, we work to reestablish a forest ecosystem through effective soil contour and restoration techniques. Our forest zone reclamation practices today are much closer to forestry reclamation where we take advantage of natural material, such as coarse woody debris and rough contour, to aid in the establishment of natural systems. reclamation (returning the sites to forests, agriculture, wetlands, or recreational and municipal land). For examples of our area-based reclamation work, read the Innovation in reclamation story. This approach has evolved into an industry leading environmental closure program. Canadian Natural has received the greatest number of reclamation certificates among our peer companies for the past several years. In Alberta, Canadian Natural received 442 reclamation certificates from the regulator, which represents 26% of the total reclamation certificates issued in the province during 2017. Read our 2017 Stewardship Report to Stakeholders for more highlights of our abandonment and reclamation programs. Our work is in accordance with applicable provincial regulations for decommissioning and reclamation that is required at all sites as part of their liability closure. Comprehensive land use planning is an essential part of our operations that considers the end of mine life so that we can manage environmental closure programs and obligations, and apply progressive reclamation activities. There are also regulations in place to ensure operators are meeting their progressive reclamation milestones. In the province of Alberta, oil sands operators are governed by the Mining Financial Security Program (MFSP) which evaluates each mine based on its economic potential and reclamation performance to manage financial risks. Our extensive and ongoing reclamation work and research in the oil sands region is described in our Innovation in reclamation story. We also manage our environmental footprint at our oil sands mining operations through tailings management technologies that will accelerate the pace of reclamation. Important steps in our ongoing reclamation and reforestation work are soil salvage programs. At PAW thermal in situ operations, more than 600,000 tree and shrub seedlings have been planted along different sites since 2000. We have also been working on revegetation strategies at borrow and in-fill reclamation sites. The photo below shows an area that was cleared and constructed in 2005. The materials from the borrow were used to build this pad and portions of the road from other pads. The borrow area was successfully reclaimed and reforested with trees and shrub species as part of Canadian Natural’s commitment to doing it right. Revegetation project at borrow and in-fill reclamation sites at PAW. Our Horizon soil management system is helping us improve accessibility to reclamation information and planning, by providing a combination of inter-related programs into a database that includes reclaimed areas, soils quality and soil disturbance, among others. In 2017, we had 15.1 million bulk cubic meters (BCM) of salvaged soil for future reclamation. 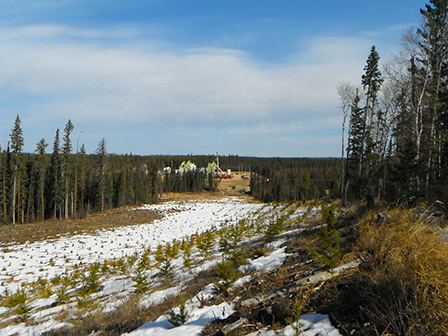 We support reclamation research through practical hands-on field trials and involvement with industry, academic and government researchers to share results and optimize reclamation practices on oil and natural gas sites, such as the Canada’s Oil Sands Innovation Alliance (COSIA) and the Petroleum Technology Alliance of Canada (PTAC). We participate in ongoing research and technology programs to learn more about diverse eco-regions and how to best manage each area. This includes soil research on improved salvage methods to retain the characteristics of soil nutrients and structures as well as seed and root stocks for revegetation. Surficial groundwater and surface water studies are in progress to better understand the effects of these water processes on long-term soil stability, erosion potential and nutrient cycling. Read our Innovation in reclamation section to learn more about our reclamation work and research projects. 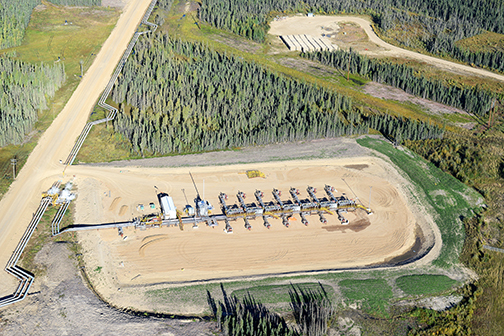 Canadian Natural has been a strong proponent of risk-based remediation standards as part of an effective and timely reclamation program for well sites. During 2016 and 2017, we worked with industry and regulators through PTAC to reduce excavation and disposal on native prairie, protect biodiversity and accelerate reclamation while meeting regulatory standards. For more than 15 years, we have also been a Corporate Member of the Canadian Land Reclamation Association (CLRA), a non-profit organization that encourages personal and corporate involvement where reclamation or rehabilitation of disturbed lands is planned or implemented.